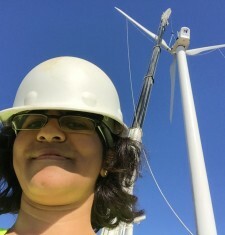 Padma Kasthurirangan is an engineer and President at Buffalo Renewables, a distributed generation installation firm based in Niagara Falls, NY, serving the western NY region. She holds a Master of Science degree in Electrical Engineering from the University at Buffalo (SUNY). She is also a NYSERDA eligible small wind installer and NABCEP certified PV installation professional. Padma and her team have been active members of DWEA since its inception and were instrumental in the passage of the remote net metering law in New York. Her team was awarded the Small Wind Installer of the Year 2016 for their outstanding work in the distributed wind industry. Padma also serves on the board of the Distributed Wind Energy Association (DWEA) and is an Institute of Electrical & Electronics Engineers (IEEE) Senior Member. When not battling utilities or climbing towers, she enjoys kickboxing, biking and traveling.